One of the most unique aspects of running a runDisney race is that the majority of runners arrive to the starting corrals in costume and the races during Star Wars Half Marathon Weekend are definitely no exception. If you are the gifted, artful, plan-ahead type, most likely you have already sorted out your duds for race weekend. However, if you are like me and were born without the craft chromosome or tend to wait a bit too long before deciding on a running costume, read on for some tips on how to create an inter-galactic outfit that would even impress Master Yoda. There are three things to consider when planning your costume : Time, Distance, and Skill. 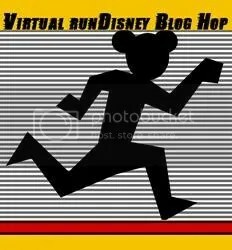 Distance: What distance you are running tends to dictate the elaboration factor of your costume. Running a 5K in full Chewbacca costume is do-able–13.1 miles in fur, not so much. While a Darth Vader costume may seem like a rockin’ idea at the costume shop, chances are you will not have those same feelings at mile 10. Choose a costume that can go the distance. Last year, my family went with regular Halloween-type costumes for the Star Wars 5K because 3.1 miles is a pretty manageable distance in just about any garb. As you increase distance, more care should be taken in choosing race wear. For the Star Wars 10K, we found lightweight Storm Trooper shirts and paired them with running shorts and socks to match–festive but practical. Half marathons are a bit more complicated because you not only want to choose an outfit that is comfortable but also durable as it needs to last for 13.1 miles. For this race, my sister and I chose Sparkle Skirts® since they not only looked awesome, but are also comfy. They have built-in, non-riding shorts that have pockets convenient for holding your gels or beans. The skirt is also equipped with a zip up front pocket to hold valuables like an ID or phone. For our tops, my sister found a light tank that had her character’s design printed on it, while I chose to use a regular, white performance tank and drew, by hand, the details using fabric markers and paint. I also created a matching headband using a basic white stretchy band and glued cut out felt pieces to the top. The costumes looked great and were comfortable the entire race. 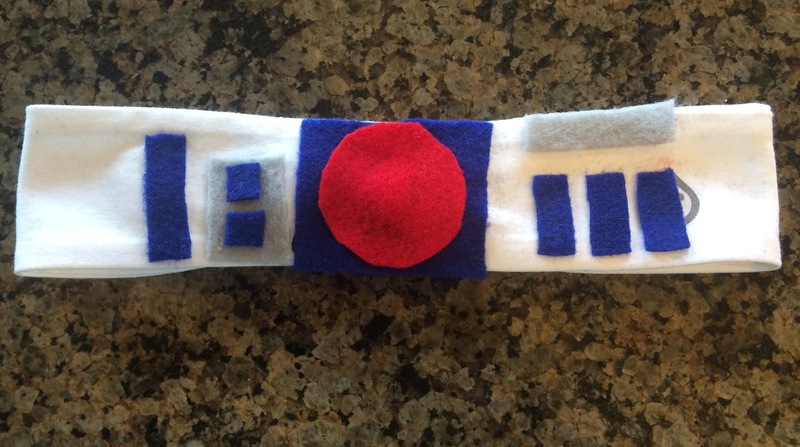 My daughter’s R2D2 shirt made with fabric markers. use but was more vibrant in color. Time: Another thing to consider is how much time you have, both time before race day and time to devote to creating your stellar masterpiece. If time is in abundance, you have many options for costumes include ordering supplies or perhaps even having a custom race costume made for you. I found my daughter’s Princess Leia outfit on Etsy at a great price. If time is limited, consider going with a simpler character and creating a simple costume. Amazon® is great for the last minute ordering items like shirts, socks, shorts, or even small accessories to add to your costume. Two day shipping can be a lifesaver! Skill: The final thing to consider when creating your Star Wars race costume is your skill level. Some people are just naturally crafty. I am not. If you are a whiz on a sewing machine–go for it! If you are like me and just flat out cannot sew, do not underestimate the power of a glue gun! Hot glue is a Godsend for those of us who cannot master the art of needle and thread. And trust me–hot glue will go the distance in rain, cold, and humidity! My final two pieces of advice DO NOT include items in your costume scheme that can fall off and trip you or another runner. Last year, the guy in front of me thought it was a good idea to run with an unsecured stuffed Yoda in a backpack. We barely crossed the start line when it fell out and I tripped on it, twisting my knee. It made for a LONG, painful race. So be mindful of your costume’s safety. Finally, DO test out your costume before race day. As silly as you may look, put it on and run a few miles to see how it holds up in a real running situation. This is a great way to check for areas that may cause chaffing too. Better to find out at home that your costume needs a few reinforcement stitches rather than discovering at mile 3 that your creation is falling apart. Good luck to all Star Wars Half Marathon Weekend runners!! You are in for an incredible experience. Enjoy it and may the Force be with you!! Click below to continue the fun!! I usually procrastinate deciding who I would like to run as. However once the ideas start to flow watch out. Also, running with stuffed animals should be a no go. I don't know how many stuffed friends I have seen on the side of the race course. I passed that guy with the Yoda in the backpack too Marge- so sorry he got you! I love your advice about considering your distance before creating a wardrobe;function before form for an endurance race! Your family sure was a model of out-of-this world; thanks so much for sharing them with us!! !